Trudy has betrayed her husband, John. She's still in the marital home—a dilapidated, priceless London townhouse—but John's not there. Instead, she's with his brother, the profoundly banal Claude, and the two of them have a plan. But there is a witness to their plot: the inquisitive, nine-month-old resident of Trudy's womb. The best book by this author I've ever read--and extraodinarily timely. In addition to offering an ingenious, original protagonist and a compelling plot, the book also spotlights most of the greatest crises and problems of our era....in a nutshell. I found this book tedious and childish. The only reason I finished it was because it a book club choice. The writing was monotonous, and the premise of being written by an unborn baby was a cliche. 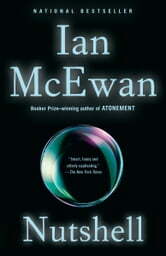 I know that Ian McEwan is a well regarded author, but this is the second book of his that I have read (The Children Act was the other) and it will be my last.